Brown, Budgets, Prisons, and Contempt. 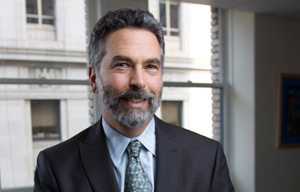 The enduring wild card in California's budget is the situation in California's prisons. This one came up here in January and back in November. The failure of the Brown administration to regain control of California prison's mental health services (which came up in April twice) led most people to believe that the State's plan to deal with prison overcrowding would similarly fail when reviewed by the courts. Thursday, the three judge panel supervising the State's reduction of prison overcrowding duly rejected the State's plan to deal with the problem. Jerry Brown narrowly avoided being held in contempt of court, but the panel made clear that, failure of the State to comply with the latest order "shall constitute an act of contempt." It's interesting to contrast this case with the decisions that are expected in Perry v. Hollingsworth and Windsor v. United States (prior blog posts on that topic are here and here) on the 24th 26th of June. The consequences of the prison overcrowding litigation will easily be as far reaching as the Prop. 8 cases, and Michael Bien deserves a lot of credit for doggedly pursuing the issues for years. economy. Mr Brown had predicted a $1.2 billion surplus for the coming fiscal year; the LAO put the figure at over $4.6 billion. This week the state’s leaders found themselves in the unusual position of agreeing a budget that did not include whopping cuts." Soccer, And Astronauts, in Sonoma County. One topic I return to from time to time is the unusual importance of soccer in Sonoma County. For instance, back in December I noted that Sonoma County produces as many female Division I soccer players each year as you would expect of a city the size of Houston, Texas. The importance of producing exceptional female athletes is an easy thing to underestimate. There are a number of national institutions where women are under-represented, and where such individuals can have a disproportionately positive impact. To name just a few of those institutions, I'd think, say, of the United States Naval Academy, the United States Marine Corps, the Stanford University Department of Mechanical Engineering, and NASA as candidates for the short list. The best, most recent example of how those soccer players can shake things up is Nicole Aunapu Mann, 35, a 1995 graduate of Rancho Cotate High School (Rohnert Park). At the United States Naval Academy, she was a Trident Scholar, and was one of the most decorated women's soccer players in Patriot League history, serving as Navy's soccer team captain in her senior year, while being named Patriot League Defensive Player of the Year two-consecutive seasons by the league's coaches. In addition to her Patriot League accolades, she earned NSCAA All-Mid-Atlantic Region honors four-straight seasons. Navy's premier defender, Aunapu's primary responsibility was to mark the opposition's top scorer. She anchored the Mids' defensive unit which set a school record with 14 shutouts in 1998 and was third in the nation for shutouts per game (0.67). The Navy defense was ranked eighth in the nation that season with its 0.56 goals-against average and allowed a league-low 12 goals, and Nicole Aunapu Mann was subsequently named to the Patriot League All-Decade Women's Soccer Team. After graduating from the Naval Academy in 1999, she joined the United States Marine Corps as an F/A-18 pilot, and subsequently attended Stanford University, where she received her master's degree in mechanical engineering. 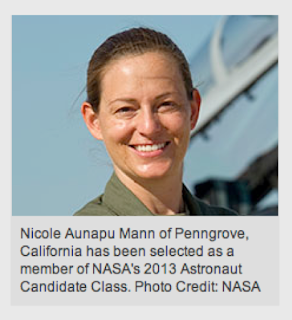 A test pilot for the Corps at Pauxtent, now-Major Nicole Aunapu Mann was selected today to serve as an astronaut by NASA. "'Playing sports at the Academy forced you into situations where you had to learn leadership skills', Mann said. 'Getting ready to play a game equals the same kind of feeling I get before I fly. You're strapped into a 40,000-pound jet, headed for a mission over Iraq or Afghanistan. You're nervous and excited and it's game time. It's time to perform. Then, you take off and you're playing in the moment.'" For those of you referred by Lorna Sheridan's article on the Sonoma Index-Tribune's web site, the piece she references is located here. Moving right along, one of the ongoing issues this year in California is the acronym "LCFF," which stands for "Local Control Funding Formula." Jerry Brown wanted to devote nearly all new tax revenue to schools, some of it to repay shortages in legally mandated levels of aid from past years and some to shift more money to districts with large numbers of poor and/or English-learner students. To quote Dan Walters, "[Brown] contends [it is] a moral imperative to help those disadvantaged students – Latino and black kids, mostly – catch up in academic achievement." EdSource (a great web site) reported today that it appears there will be a compromise as part of the deadline to pass the California budget this week. I've blogged about LCFF previously in February here and back in January here. As expected, wealthy suburban districts demanded changes (San Ramon Valley is the poster child in EdSource's article), and duly received them. However, the change is still pretty good news. 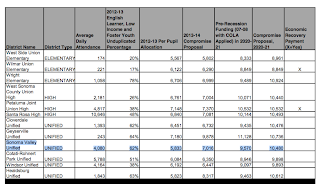 "Complete District by District Breakdown"
On the right is how Sonoma Valley Unified will fare under the plan. 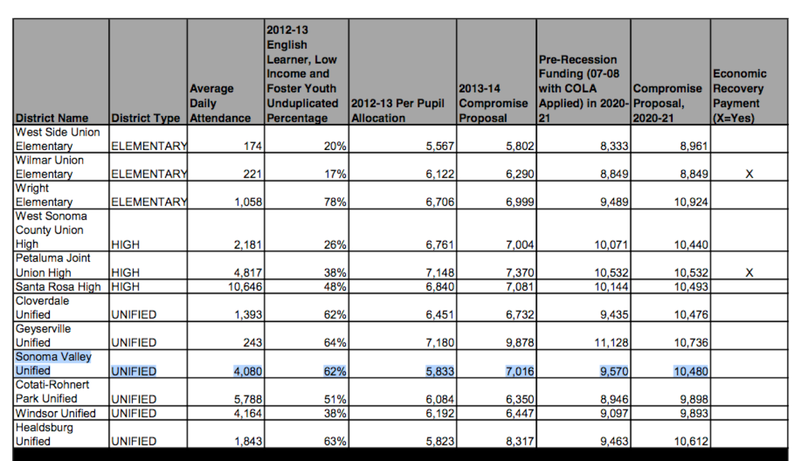 The table demonstrates exactly how important the concentration grant in the LCFF is; the threshold for the grant is 55%. For example. Cotati-Rohnert Park Unified, whose funding at the moment is roughly similar to SVUSD, and which is listed immediately below SVUSD on the chart, falls below the threshold, at 51%. Sonoma Valley clears the hurdle, at 62%. SVUSD will therefore receive a year-on-year increase in funding of $1,183 per student; Cotati-Rohnert Park's will be only $266. The difference will continue as overall funding rises through 2019-2020. The total increase in the next fiscal year for SVUSD, under the plan anticipated to be passed this week, will amount to $4,826,640.